Photo courtesy of hale_popoki at Flickr.com. 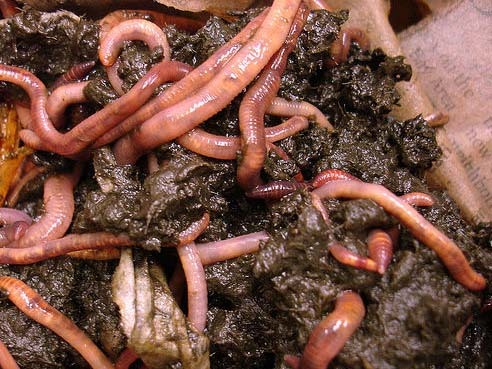 Worms are nature’s own garbage disposal. They work quickly and turn shreds of garbage into smaller and smaller pieces. Soil passes through a worm about 5 times before reaching a well-balanced and stable form. Vermicomposting quickly turns fruit and vegetable scraps into nutrient-rich compost. 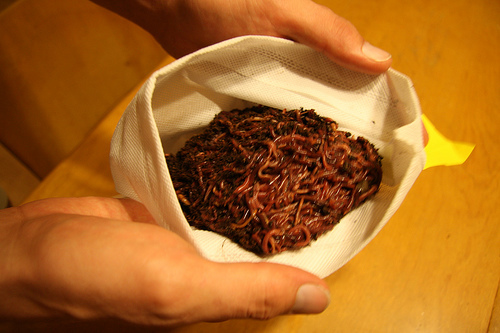 Worms make excellent pets, but they need a comfortable home to live in. Just like dogs need a doghouse to protect them from the rain, worms need a snug home that has just the right conditions. Worms need to be protected from sunlight, excess moisture, and predators. Worm bins offer all of this and more. The lid keeps rain and birds away, and a well constructed worm bin allows liquid to drain from the main compartment into a holding cell. This plant friendly liquid is called compost tea, and many worm bins have a spigot you can use to drain the compost tea for watering houseplants. After you choose a worm bin with the right size and features, the first step is to put a layer of shredded paper, cardboard pieces, or coir in the main compartment. This “brown compost” is rich in carbon, and the worms will eat it slowly to supplement “green compost” food scraps (which are rich in nitrogen). It will also keep baby worms from falling through the gaps. Once this lining is in place, you should put in several shovelfuls of healthy soil. The amount of soil will depend on the size of the worm compost bin, but the ideal amount will produce a pile 3-6 inches deep. When you add scraps to the compost bin, it’s important to bury the worm food underneath this soil but above the lining. There are foods that worms like and foods that are no good for them. The best foods are kitchen scraps, such as fruit scraps and vegetable peels. Tea bags, coffee grounds, and filters also work well. It’s best not to use meats, oils or dairy products, because those scraps can attract flies and other pests. Foods that have been cooked with oil or butter should also be avoided. After the ingredients are ready, it’s time to get some worms! There are many different varieties of worm, but red wrigglers are the most popular. They’re also widely available at bait shops and pet stores (check the live food section). Red Wigglers are also called brown nosed worms, and their scientific name is Eisenia foetida. Unlike other worms, they like to stay close to the surface and will be happy in a shallow vermicompost bin. After that, there’s not much to do. Add worm food regularly, and remember to drain the compost tea before the holding cell gets full. There is usually plenty of water in kitchen scraps to supply the worm’s needs, but if you live in a very dry or warm area, it may be necessary to occasionally add a little bit of water. When the worm composter gets full, or when the worms eat all of the lining material, then it’s time to empty out the vermicomposter and start again. Photo courtesy of readysubjects at Flickr.com.